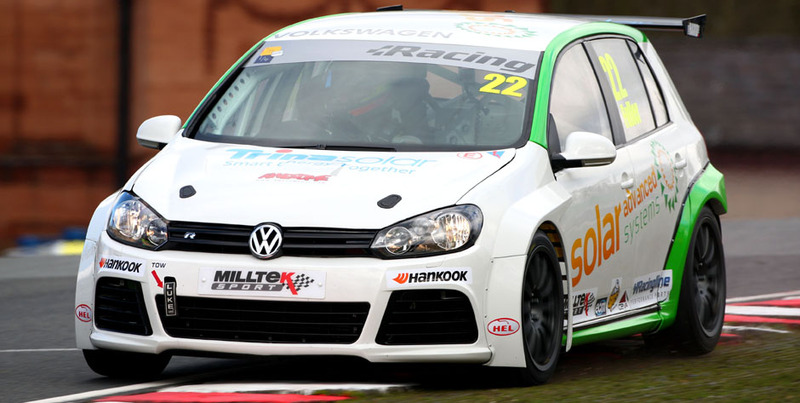 SlideSports driver David Sutton made the perfect start to 2015 during round one of the Milltek Sport Volkswagen Racing Cup at Oulton Park this afternoon with a dominant lights-to-flag victory ahead of former champion Aaron Mason. 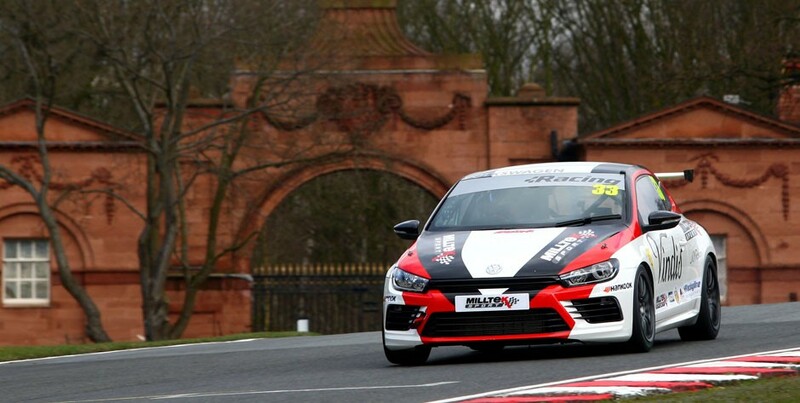 Scirocco driver Sutton, who is only registered for the first weekend at present due to budget restrictions, more than confirmed his championship potential with a very comfortable 2.3-second victory as well as the fastest race lap and a new lap record. Mason, who had to settle for sixth on the grid after a spin at Shell Oils Hairpin late on during qualifying, made a sensational start to leap into the top three before then quickly usurping Howard Fuller for second. While almost matching Sutton’s pace during the latter stages, Mason wasn’t able to get on terms with the leader, who had already pulled 1.3 seconds clear of the pack on lap one alone. 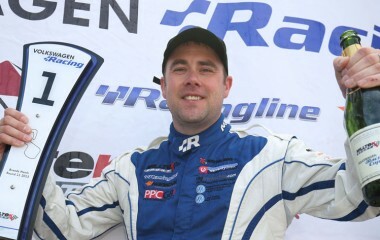 Fuller, who started second on the grid as the only Golf pilot on the first four rows, came out on top of a tight battle with Lucas Orrock’s Scirocco to claim the final spot on the podium. Conditions for round one were a big improvement over the morning’s qualifying session, overnight rain leaving the track very damp for the grid-determining shoot-out – although it did dry sufficiently for times to tumble with slick tyres as the session progressed. 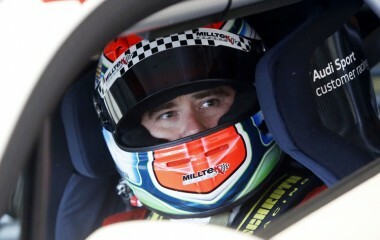 Sutton, as he ultimately managed to do in the race, dominated to take pole by 0.6 seconds. The original race start had to be abandoned when a mid-pack tangle resulted in Simon Andrews’ Golf and Cameron Thompson’s Scirocco becoming stranded on the grid. At the restart, over a shortened 15-minute duration, Sutton repeated the excellent getaway he managed at the first time of asking and quickly pulled clear. 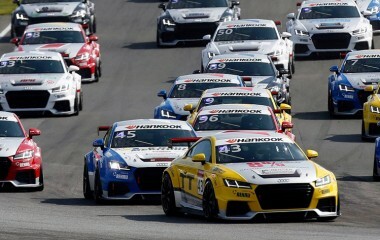 Mason, Fuller and Orrock were pretty evenly matched for the bulk of the race, with lap times within a tenth or two of each other, but the 2013 champion managed to edge away from his two rivals during the closing stages to take the runner-up spot, 1.5 seconds clear of Fuller. Orrock, who qualified his Milltek Sport Scirocco third on the grid, led Fuller for almost the entirety of the eight-lap contest despite immense pressure from the Team HARD driver. Having a late look on the brakes at Old Hall on the penultimate tour, Fuller then repeated the move successfully on the final lap to grab the position. Joe McMillan finished what, for him, was a largely uneventful race in fifth position with reigning champion Joe Fulbrook a strong sixth. Having struggled with gearbox problems in qualifying Fulbrook had to settle for 11th on the grid, but in the race his class showed as he sliced his way through into the top half dozen. 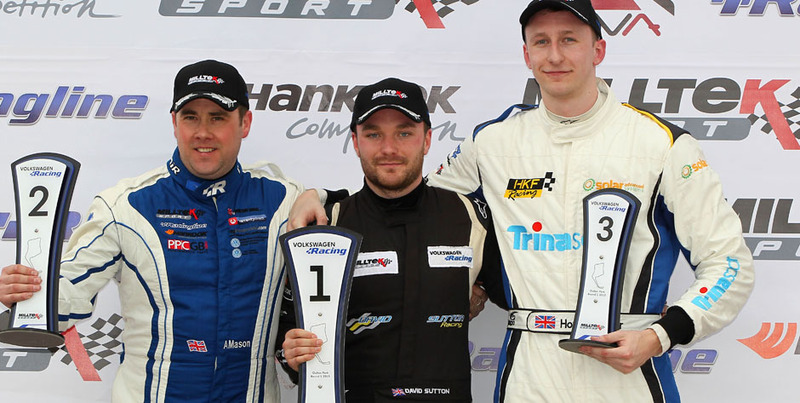 Completing the top 10 finishers were Maximum Motorsport’s Lee Allen, Cooke & Mason’s Jack Walker-Tully, Team HARD’s Bobby Thompson and PH Motorsport’s Phil House – the latter having slipped out of the top 10 on lap five, having been a top-five challenger early on. Simon Deaton, who climbed from 14th place into 11th at the finish, was named the ‘Sportsman Trophy’ winner. Aside from the incident involving Andrews and Cameron Thompson, only two other drivers failed to make the finish. 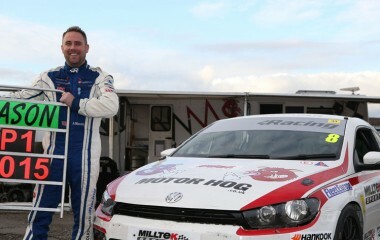 Chris Panayiotou exited the race on lap seven at Shell Oils while Paul Dehadray’s Scirocco slowed to a halt a lap earlier. 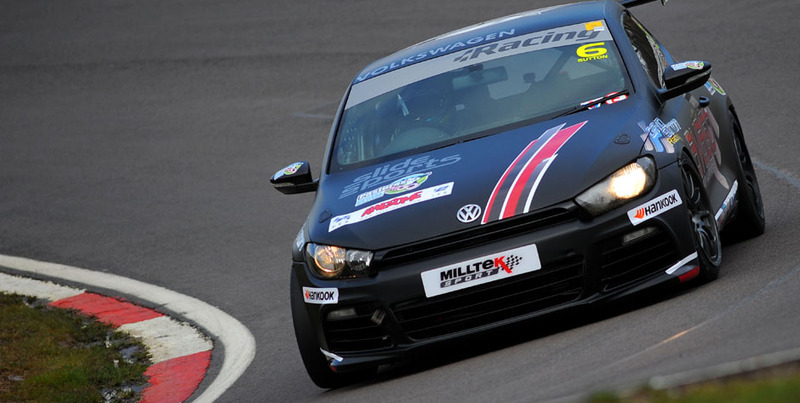 Rounds two and three of the Milltek Sport Volkswagen Racing Cup are scheduled for Easter Monday at Oulton Park.